A movie that tries desperately to recapture the magic of the original and ends up feeling dull and tired, due to a lack of story and interesting characters. This film wants very badly to capitalize on what made the first movie work, and it just can’t seem to pull that off. For starters, it has a very weak story of it’s own. now the actual story that this is based on, involving three different battles of the persian wars, is fantastic. only this movie finds a way to screw all of that up. That’s probably because it keeps the previous film in its rearview mirror, constantly trying to remind us of it, telling us of what happened in that film, and is supposedly now going on at the same time as the events in this movie. to be fair, the mentions of the other movie are one of the better aspects of this film, but that’s only because this movie has nothing new to offer us of its own. it features two main characters, on either side of the greek-persian wars, and both are incredibly boring. and then there’s the action, which isn’t half as good as it should have been, mostly because the ridiculous use of computerized, in your face, puddles of fake blood. This movie definitely has a lot of problems. They say that there are two genres of movies where if everything else is done right, then story and characters don’t really matter all that much. Those genres are action and comedy. With comedy, if the movie is genuinely, laugh out loud-funny, that’s all that really counts. With an action movie, it’s about the stunts, visuals, and choreography. In other words, an action movie can be good without the usual essentials of plot and character. But most action movies don’t deliver as well as they should on the stunts and choreography, and that’s when the story and characters do become a necessity, and really do make a difference to the overall film. 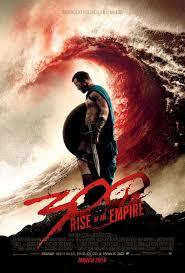 300: Rise of an Empire is one such example. The action is not that great. in fact, the only action sequence that really feels well put together and executed with precision is the final climactic scene with men fighting with swords, shields, and spears while on the decks of a ship. other than that, the action is mediocre at best. that’s because this movie utilizes computer effects so heavily that it doesn’t mind looking incredibly fake. now, the first movie, 300, did use computer effects and green screen heavily as well. and in that movie it worked. but there’s one key difference, (in terms of the computer effects) between that movie and this one. the fake blood. 300 did not go crazy with fake blood. sure, it was the there, and popped up into the air whenever a character got struck, but it was like small doses at a time. kind of like dirt and grainiess flying into the air, the way a character might spit blood when getting punched in the face. in 300: rise of an empire, it is buckets full. huge puddles of blood fly right at the screen any time there’s even the slightest bit of action at all. now, it’s not the amount that’s the problem (after all, kill bill: volume 1 was loaded with massive amounts of blood, and for that movie it worked.) the problem is the amount combined with how incredibly fake it looks. in 300: rise of an empire, the blood looks like floating drawings of puddles moving through the air. it is so ridiculous looking that it actually takes you out of the action. this leads us back to the importance of story. if the action was dead on and well put together, story would not be as essential. but since in this movie, the only action that is truly good comes at the end of the film, we do need to rely on story and characters to keep our attention. in this movie, neither one of them is all that great. the story is about the persian wars. these are the wars the persia fought against greece, during the height of the persian empire. there were three major battles in these wars. the battle at marathon, the battle of thermopalae, and the battle of salamis. the original film, 300, was made about only one of these battles. that entire movie was about the battle of thermopalae, where an army of a little more than 300 spartans (360, i believe), held off the persians for a long while, in the narrow pass between cliffs and moutains. that movie, directed by zach snyder, was incredibly successful. it launched snyder into the category of a list directors so that he is now the go to guy for d.c. superhero films. part of the appeal of that movie was that it really was about just one battle. now that included all kinds of fights and action spread out through the course of the film, but the main thing was that it didn’t try to anything bigger than it was. it wasn’t telling the story of an entire war. that enabled it to focus more on the characters and the events at home. we spent nearly as much time in sparta itself, as we did with king lionides (gerard butler), on the battle field. that meant we got to see the spartan senate and government at work, we got to experience the corruption of one of those senators, and to learn about how spartan children were trained. 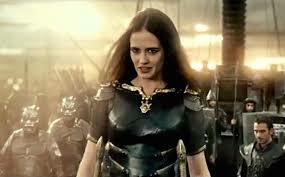 in 300: rise of an empire, all of those personal touches are long gone. instead, the movie tries to cover all three battles in a single film. that means it opens with the battle of marathon, (which is so rushed that it barely does justice to the battle) and closes with the battle at salamis. it also doesn’t get either one of these right. yes, athens (which is the city front and center in this film, the way sparta was in the other film,) was primarily a naval power, but the battle of marathon was fought on land. it involved a trick in the formation of the athenian army where they strenthened their wings (sides) and weakened their center. when the persians came crashing through the center, the athenians closed in on them from the sides. none of this is in the movie. neither is any hints at why it was called marathon, the amazing run that a messenger made to warn the athenians, and how this is where we got the word “marathon,” which is commonly used today. it’s as if the people who made this movie barely read up on their history at all. that’s because this movie has a set agenda, and does not plan to deviate from it at all. the agenda is to feature two leads, a guy who is the head of the athenian army (themisticles) and a general who is in charge of the persian army (artemisia, played by casino royale’s eva green.) neither one of these characters is interesting at all. the agenda also includes seeing how persian god-king xerxes got to be the way he is. that means we start out with his father, darius, being killed at marathon. then we watch xerxes go on his desert journey, find a cave of mutant men, take a dip in a magical water, and get transformed. this part of the movie might not be the smartest, but it is probably the most interesting content of the story. we also see and hear plenty about lionides. now gerard butler isn’t in this movie, and so when we see his character, it’s mostly with him out of focus in the background. there are one or two shots of him taken from the previous movie. but mostly we just hear news about what it is going on at the battle of thermopalae. i like how some of this movie is meant to take place at the exact same time as the events of the other film. in fact, it is all of the connections this movie tries to make to the story of the first film, which help keep it’s head above water. as a movie unto itself, this film is lousy. as a movie that is grasping at straws to remind us of the first film and connect the story to what went on their, a lot of it works. 300: rise of an empire is not a very good movie because it doesn’t really have anything new or interesting to offer. the action is lousy and the characters are weak. the story is okay. it gets interesting when it tries to connect the happenings of the athenian army with what is going on at sparta at the exact same time. for example, we see xerxes getting the word about what happened to the messengers he sent to sparta. in the first movie we saw what happened when those messengers went there ans lionides kicked them into a pit. so the connections to the first movie work, but whatever this movie has to take ownership of for itself, does not. the two main characters are both incredibly dull and uninteresting. lena headey, reprising her role as lionides’ wife, is barely in the film. she should have been bumped up to a more prominent role and we should have followed her story in sparta at least as often as we did the other two leads. not only does this movie get the facts about marathon wrong, but also those about salamis (which was a battle where athenian ships outmaneuvered persian ships by slamming them into the mountainside and cliffs.) now, i have no problem with a movie taking liberties and making changes in order to make a story even better, only here it is the opposite. the story of what really happened was great, and what they changed it to was lousy. what a disappointing film.